Doon mass rock is where secret mass was held during the penal years (1695 – 1741). During this time Irish Catholics were not allowed to openly practice their religion or display their faith. The Priests said mass under the threat of death. If caught they faced a horrendous death such as being placed into a barrel of nails and thrown over a cliff. This was called ‘Binn an Sagairt’ (hill of the priest) which is located near Doon. With the constant threat of death the mass rocks in Ireland were located in rural areas. The congregation would secretly make their way from their homes and gather in remote locations. 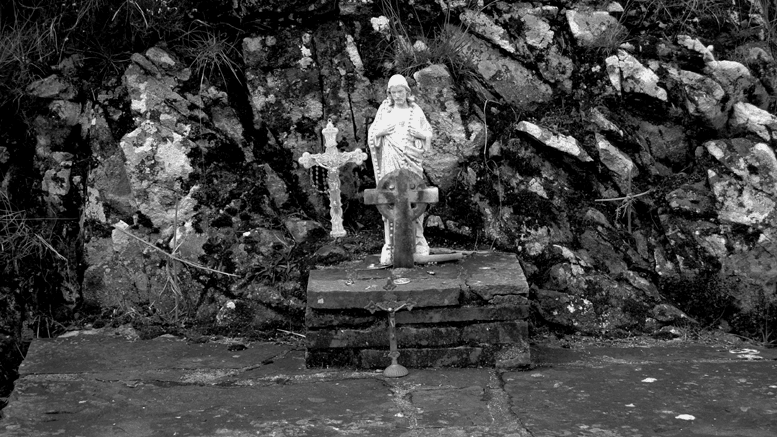 Many of the mass rocks today are now shrines attracting pilgrims from local areas and a far. No-one can go to Doon and not go to see the Holy Well. Situated beside Doon Rockthe Well is very accessible and is wheelchair friendly, placed in a pretty little garden beside a house the owners tend to the well and garden. 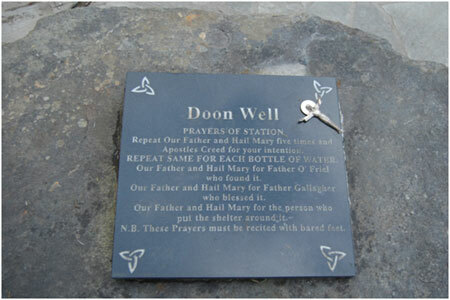 Doon Well’s origins, like most holy wells in Ireland, are pre-Christian. The natural spring water would have been used by the pagans either as a healing source or for inauguration ceremonies like of the O’Donnell clan. Bronze age artifacts have been unearthed near the well and there is a ‘togher’, an ancient wooden road that runs underneath the bog adjacent to the Doon mass rock. It is a very special place and has a holiness and peaceful stillness about it. You almost feel as though you should whisper as you would in a church. In fact, stations and rosary are still walked from St.Columba’s chapel to Doon Well every New Years Eve and on the day before May 1st. 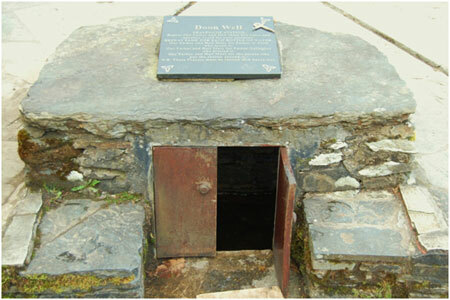 Doon Well became a Holy well possibly in the 15th century when a man called Lector O’Friel blessed the well. Lector O’Friel was a powerful healer and a very holy man. Sufferers of all sorts of illnesses and incurable conditions came or were carried to see him in the hope of a cure. Many stories are told of the miracles that he preformed. Legend says that when he was in his old age and death was upon him the people became upset at the thought of losing such a holy man into whom God had placed such a wondrous gift. On hearing the people’s lament, Lector O’Friel is reported to have said, “When i die, my powers will live on after me.” With this he blessed the well and told them that those who drank or applied the water would benefit from his prayers of intercession. N.B These prayers must be recited with bared feet. Doon is easily found as it is well sign posted; it is situated 8 miles outside of Letterkenny and 2 miles from Kilmacrennan on the main road to Creeslough. It has a spacious car park and has toilet facilities but no other amenities. Doon Mass Rock is a lofty, wild, barren place but the atmosphere that you feel is one of majesty. You can almost sense the presence of the mighty clansmen of the O’Donnell clan who were inaugurated there. It is an uneven climb to get to the top but very well worth the slight effort as the panoramic view you get from the top is spectacular. Heather grows between the gorse covered rocks and you are overlooking a sparkling natural Lough. Immediately you are transported back in time and if you close your eyes you can picture what the inauguration of the kings must have been like but also of the secret religious ceremonies that took place here. Follow the path and you will find a secret place where there is situated a mass rock. This is a very Holy place and you can feel a certain reverence come over you. It is an amazing place that pilgrims still come to to-day, this is evident by the amount of Holy relics that have been placed on and around the mass rock and there is a beautiful figurine of the Virgin Mary surrounded by smaller statues of Our Lady.